“Selfie time!” is a phrase that many of us hear on a regular basis, and even more so when it comes to gatherings with family and friends. Check out social media accounts of many people today, and you will see selfies and food shots being two very popular themes. Well, the front-facing camera has certainly improved by leaps and bounds over the years in a smartphone, but there is still room for improvement. Case-Mate knows this, which is why they have worked with Allure in order to deliver the all-new Allure x Case-Mate Selfie Case. 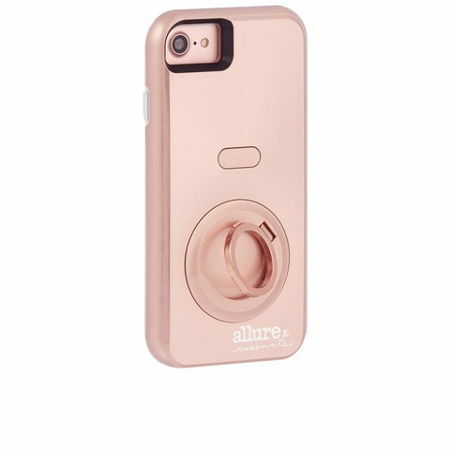 This particular Allure x Case-Mate Selfie Case will feature adjustable, professional-grade LED lighting that can illuminate the user’s face with a soft, flattering glow. The case itself comes with a 360° rotating ring that delivers additional functionality and security; all the while maintaining dual-layer drop protection. The user is also able to capture up to 2,000 selfies with a single, full charge. In order to sweeten the deal, the Allure x Case-Mate Selfie Case comes with a complimentary one year subscription to Allure Magazine, as well as a month’s subscription to the Allure Beauty Box. The asking price for the Allure x Case-Mate Selfie Case? $70 a pop on Case-Mate’s e-commerce site, although folks will soon be able to pick it up from their local Verizon retailer in due time as well. Those who are interested can choose from rose gold or a shade of black, with the latter being made available only some time down the road. Now the Allure x Case-Mate Selfie Case is a new smartphone case that delivers protection while offering a stylish solution at the same time. Those who love snapping selfies would definitely want to check it out, and it is one of the very few smartphone cases that needs to be charged, now how about that?